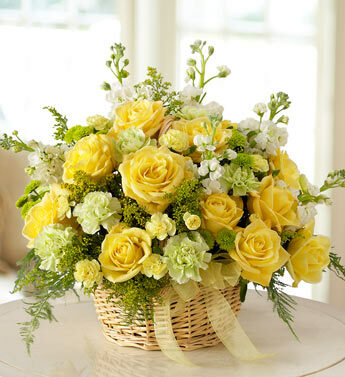 Help them draw strength and hope during difficult times with the beauty of flowers. This elegant floral basket display is expertly designed with an assortment of roses, carnations, asters, waxflower, and more. Available with red, pink, or yellow roses, with coordinating ribbon. Traditionally sent by family, friends and business associates. Delivered directly to the funeral home. Due to the urgency of the occasion, only the freshest flowers available, so components may vary.